Hello everyone, I would like to introduce you my second Android application published on Google Play – GAG Pictures. Compared with the first one, this application is intended to bring you much fun. GAG Pictures is your daily set of funny images! 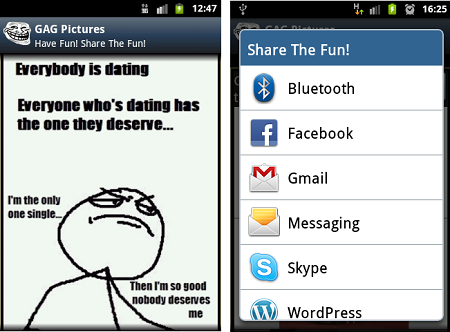 Every time the application is launched it downloads a set of new funny images from the famous site 9gag.com. Every image has a Share button so you can share that hilarious image with your friends. The current version allows you to share only the direct link to image, but in the upcoming releases the ability to send the image itself will be provided.